When I bought the Almond Joy Egg and Mounds Egg on sale at Walgreens, I was not only excited to pay only fifty cents apiece, but I was thrilled to find classic candy turned into an Easter treat. I held high expectations for both, since I’m a sucker for the heavily sweetened coconut that fills both Mounds and Almond Joy. Almond Joy is my favorite of the two, and I generally shy away from buying the bars because I usually want to eat them until I feel sick. Needless to say, I hurried through dinner, ready to taste coconutty goodness in holiday form. I chose the Almond Joy Egg first. When I unwrapped it, I was disappointed to see that there was clearly only one almond in the egg, while two are pictured on the package. I also thought it was rather odd that the 1.1oz egg was really shaped like half an egg, or an egg with a flat side. Nevertheless, I bit into the Almond Joy with optimism that it would be great candy. 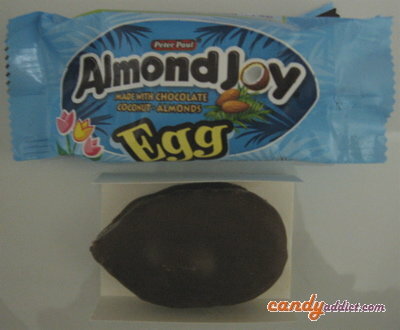 I wasn’t disappointed, but I wasn’t super pumped about the Almond Joy Egg, either. The chocolate coating seemed thicker and more prominently tasteful than in a regular Almond Joy bar, and the coconut was not as sweet as I’d anticipated, although I did like the density of the filling. The single almond was crunchy and perfect, but definitely needed a twin. Minor complaints aside, I scarfed down the egg and reached for its counterpart, the Mounds Egg. Like the original Mounds bar, the egg is similar to an Almond Joy, but is coated in dark chocolate and is filled solidly with sweetened coconut – no almonds. I had slightly lower expectations for the Mounds than I did for the Almond Joy, but I was struck by the goodness of the 1.2oz egg. The egg (flat on one side like the Almond Joy version) was true to Mounds’ taste, although the chocolate coating may have been a bit thicker. The inside was dense, rich, chewy, and extremely sweet and coconutty. 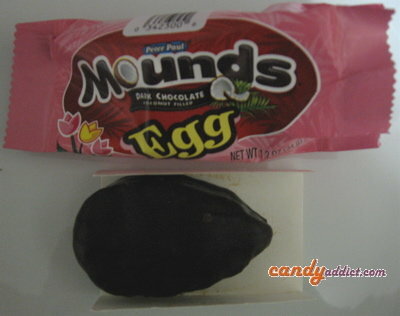 To my pleasant surprise, I favored the Mounds Egg over the Almond Joy Egg, and would definitely buy one again – especially if it’s still on sale. At the end of the day, we’re all faced with limited (well, limited for most of us) budgets and voluminous and ever-changing candy aisles. Holidays can make navigating those aisles both more exciting and more frustrating, and if you’re looking to make a quick run through and grab something tasty, I recommend Mounds Eggs. If you prefer almonds, pick up a regular Almond Joy and put Easter stickers on the wrapper if you want to feel festive. I’ve had these and just recently from good ol’ Walgreens as well. Walgreens always comes through for my candy needs at holiday time, especially. Though they’ve yet to carry any multi-national candy bars (some of my faves involve honeycomb, i.e. Violet Crumble and Crunchie), they still have everything else, it seems! I bought these two last week and have always preferred Mounds because of the dark chocolate and found the egg just as fabulous. OK, it’s up there with a Reeses Peanut Butter egg for me! Mmmm! I gotta say, too, that my Almond Joy egg only had one measly almond as well, and I agree that is at least one almond too few!